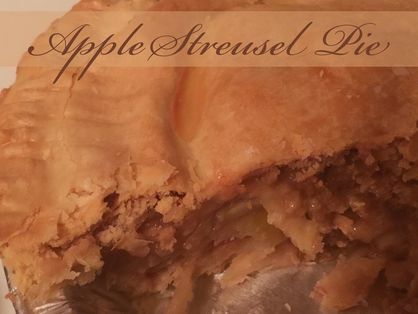 This dessert has all the homey goodness of a traditional apple pie with the sweet, cinnamon layer of streusel just under the crust. Line a 9 inch pie plate, with 1/2 of the pasty. In a bowl toss apple slices with lemon juice. Add white sugar, flour, cinnamon and salt. Spoon into the pie shell. Combine the streusel ingredients in a small bowl, until crumbly. Spoon mixture over top of the apple layer. Cover with remaining pastry. Seal and flute edges. Mix together 1 egg white and 2 tbsp water. Brush over top of the crust layer. Bake in oven for 10 minutes at 400F. Reduce to 375F and cook for another 40 minutes.